I’m an important part of my family. Wife, mother, daughter, sister. The mother bear in me is cuddly and soft, but fierce when defending loved ones. I’m a fiercely loyal friend. I want only the best for my dearest friends and would do anything for them. I’m a devoted employee. I love my work and the people I work with are more than just co-workers, they’re close friends. I’m becoming a stronger member of the community. I volunteer with Scouts Canada, I take an active role in my neighbourhood and I have deep commitment to the ecosystem. While all of the above statements are lovely, none of them reveal anything about me. They could describe anyone. These days I feel like nobody knows me beyond my public persona. Who am I when no one is looking? When no one is needing me? When I’m just, well, me? 1) Free up some personal time: I’ll finish Andy’s busy book – this should free up some time once it is complete. It is almost done. I should clarify: 10 pages are almost done. My goal of 20 pages was just too lofty. The 10 pages that have already been created just need tabs sewn on each page, corrugated plastic inserted into each page’s pouch, then a seam sewn across the bottom. If I get a chance to work on the other 10 pages I’ll be thrilled, but I’m not going to beat myself up in the meantime. 2) Train to be in better physical shape: Each day I’ll make an effort to incorporate some exercise. I need to be in much better shape if I’m going to do any hiking or cross country skiing. Leaving the van at the house and walking to daycare to pick up the boys each day is a good start. I could even take the jogger stroller and, wait for it, here it comes… jog. Note to self – must buy a better bra with more support. 3) Commit to a plan that includes an activity I want to do: I’ll plan, far in advance, a day for going cross country skiing this winter. I’ll go to one of the local mountains and rent a set of skis/boots/poles. The advanced planning should take care of the weekends getting away from me. I know Daryle won’t want to go with me, but Daniel is now old enough and perhaps other friends and family would like to join me. We’ll head out early, ski for a while in the morning, have lunch, complete with delicious sandwiches, fruit and mugs of hot chocolate. If we still have any energy left, we can ski for a little while in the afternoon. 4) Commit to writing every day: Whether at home, work or somewhere in between, I’ll take the time to explore different topics. Perhaps I’ll pick a theme to cover in a particular week. Who knows? The nice thing about writing is that it can be as personal or impersonal as you’d like, covering any topic under the sun, taking many different formats, styles, etc. 5) Accept that some things aren’t on the agenda at the moment: It just isn’t feasible right now to take up drumming. Perhaps when the boys are a little older I’ll have more time to take some drum lessons. But for now, I’ll be content with the occasional session of closet drumming at home. 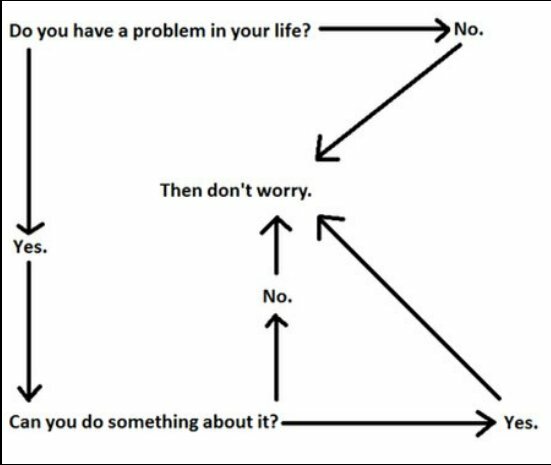 In the meantime, in accordance with this diagram posted by a very dear friend, I’m not going to worry. I’ll take action when and where I can and I won’t worry about the things that are out of my control. This entry was posted in everyday musings and tagged friend, mother, personal goals, work. Bookmark the permalink.